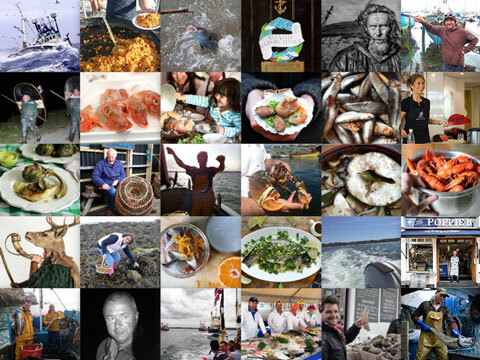 With relatively calm weather still prevailing nationwide, all the UK’s fishermen are out at sea and working hard to bring home some of the finest fish and shellfish you’ll find anywhere. Good weather normally means a good bounty – with good prices to match. So what’s about this week? The pelagic fisheries are very healthy at the moment with good supplies of mackerel arriving from most major ports around the country. Herring and sardines are also around in increasing numbers, so take advantage of these incredibly healthy fish at their best price. Haddock is at its peak now. Icelandic, line-caught, MSC-approved fillets are arriving fresh overnight in a range of sizes to satisfy all demand. Prices have gone down slightly this month, too, possibly due to the abundance of other fish currently around. People often try to recapture special holiday moments by recreating a memorable dish, such as snapper, grouper or swordfish steaks enjoyed on an exotic island – all of which are readily available on the market. These are all simple to prepare: heading, gutting, scaling and washing, plus a little bit of confidence, is all that’s needed. They’re easy to cook, too, and can be baked, roasted, grilled or pan-fried. A real favourite in this mould at the moment is carpe rouge (pictured above) from Senegal. 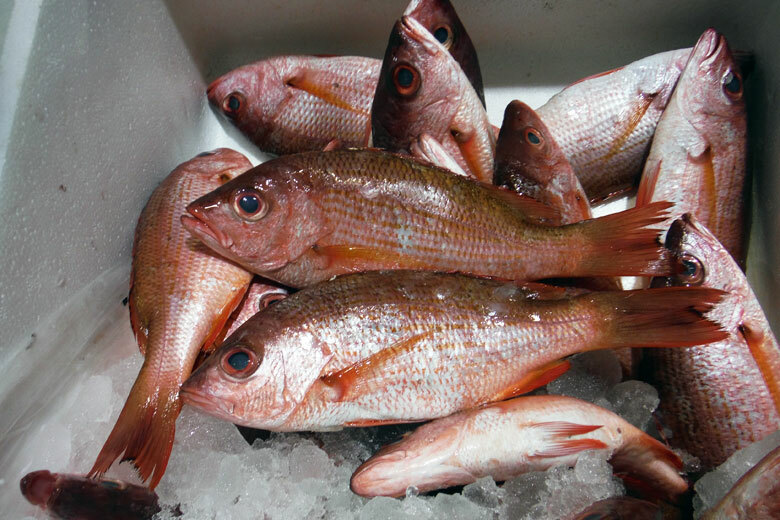 A bright red, scaly fish with a large eye and a unique, rich flavour, it’s gaining in popularity by the week. The price at present is quite modest, but is certain to rise if the TV celebrity chefs show interest. 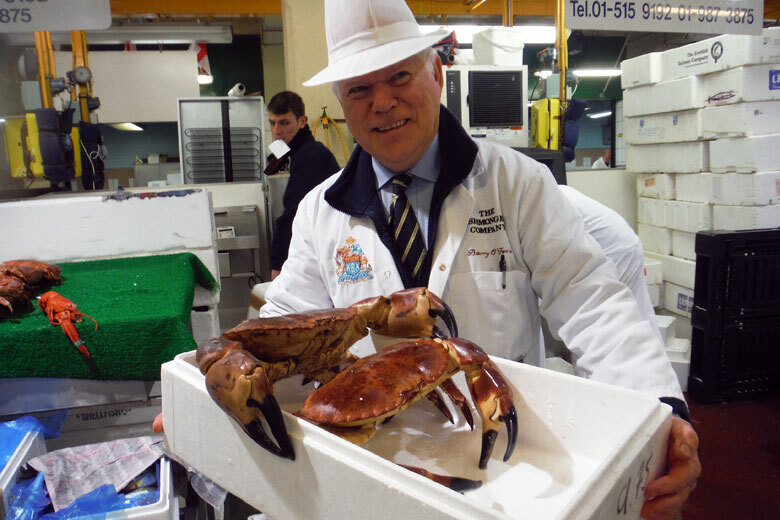 Some seriously large crabs (top) are arriving overnight from Cornwall, weighing in at a hefty 5.5kg. Crabs of this size don’t hang around: there’s no point in looking out for these, as they will all go straight to the top restaurants. But there are plenty of regular-sized examples about, too. 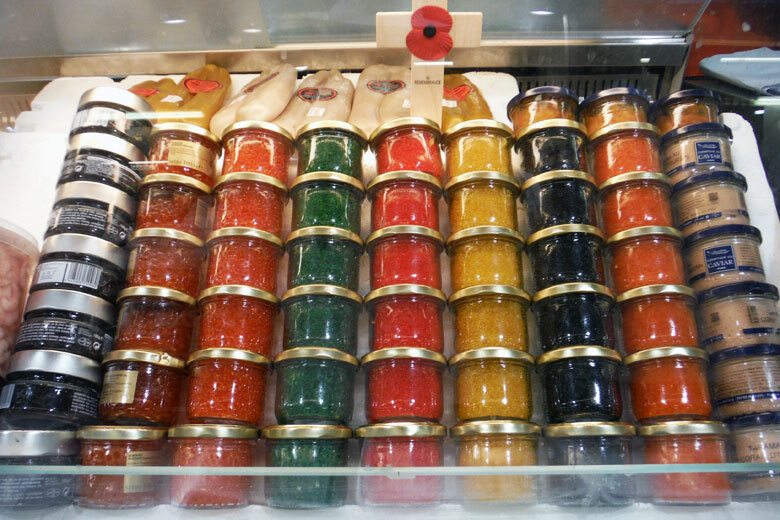 Finally, if you want to add a bit of extra colour and flavour to your dishes, remember that the array of fish roes (above) available here at the market is unsurpassed. 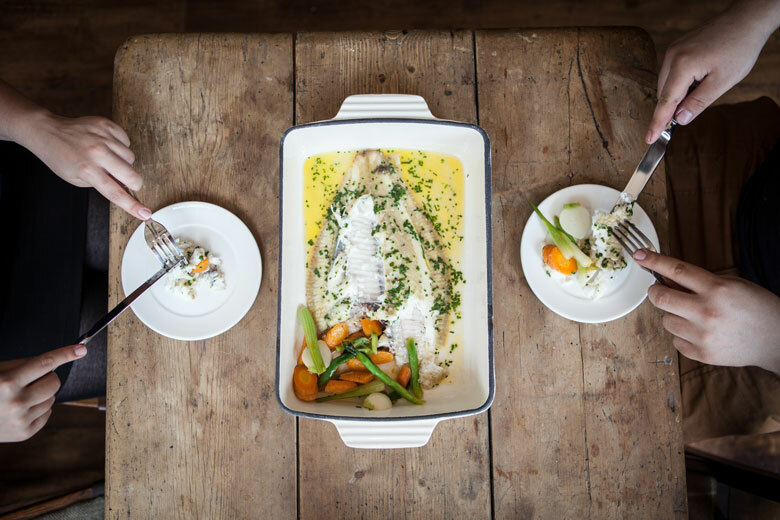 This is some of the healthiest, purest food available, and with sustainability a by-word in the industry today, native stocks on the increase and high-quality farmed produce coming onto the market in increasing volumes, it can be enjoyed with real confidence.